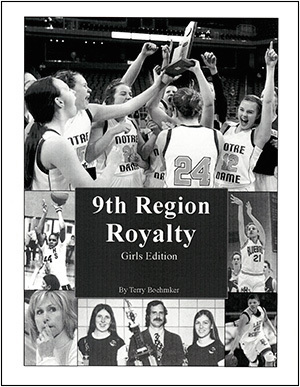 9th Region Royalty: Girls Edition contains stories and pictures about each of the 9th Region championship games played since 1975. This book is a way of recognizing all the players and coaches crowned regional champions. Each page of the book includes scores from regional tournament games and a scoring summary from the championship game. At the bottom of most pages, you will find the regional all-tournament team. For the years when an all-tournament team was not published, a short article about a game, player, or coach was substituted.